Everyone is a little Irish on St. Patrick’s Day! 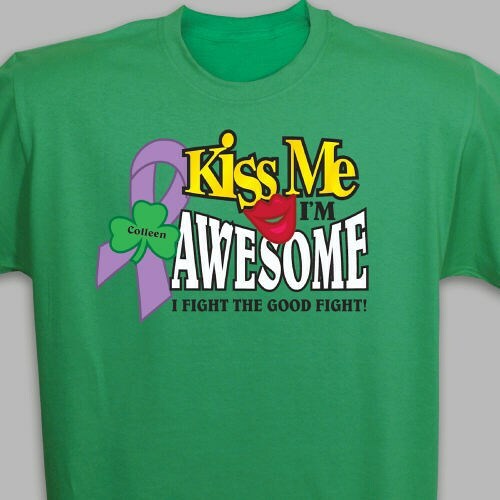 Show how cool you are with a Kiss Me I’m Awesome Awareness T-Shirt. This St. Patrick’s Day Awareness Shirt supports the cause and shows your strength and determination to never give up the fight. Our Irish Awareness T-Shirt is great for spreading awareness this St. Patrick's Day! Each Awareness T-Shirt is available on our 100% cotton Green or Black T-shirt, machine washable in youth sizes XS-L & adult sizes S-3XL. Free Personalization is always included! We will personalize the shamrock with any name or you may choose to keep it blank. Additional Info Everyday is a good day to show your support and awareness. That is why you will find a tremendous amount of Awareness Apparel & Gear for you to raise awareness and show your commitment to never give up the fight. For more ways to spread your awareness, please also view our collection of Relay Event Awareness Gear.